Healthy farms depend on good soil. Obvious as that may seem, just like any healthy body, good soil, used hard, becomes depleted and requires nourishment and rest. A more familiar term for regenerative agriculture is “environment” — care of the land on and around the farm. It includes soil health, water management, fertilizer, pest control, cover crops, etc. Healthy land is key to sustainability. 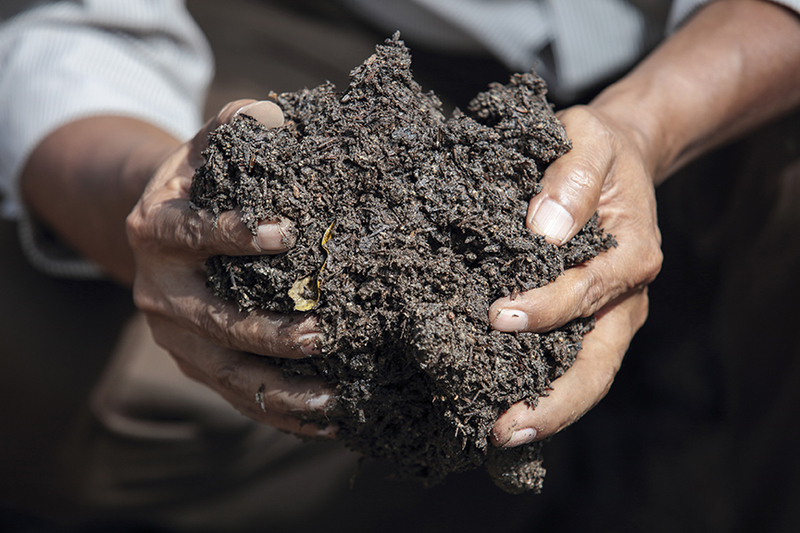 Regenerative agriculture rebuilds and protects soil so that it can continue to be productive. The approach also replenishes and protects the ecosystem at the farm and surrounding landscape. Because the majority of rural households earn their living from the land, their lives and livelihoods require attention to the farm and the surrounding environment. Most family farmers that we serve work depleted land. In many places, loss of trees, erosion of soil and reduced fertility has left farmlands and surrounding ecosystems seriously degraded. Climate change puts our farm families at an even greater risk. Natural resource management helps farmers develop soil, water and ecosystem management techniques that restore productivity and make farms and ecosystems more resilient. Simple, perhaps. But not always easy. The vast majority of smallholder farmers depend on rain-fed agriculture. Of course most farmers depend on rain. They’re concerned about getting too much or too little. It matters when the rain falls; too much too early can delay planting; too much too late can hurt harvests. But farmers in developed countries often have access to irrigation and other strategies. Our smallholder farmers seldom call on those resources. That means droughts and floods pose great danger to smallholder harvests. Higher temperatures may also stunt or whither crops and attract more pests. After intense rains, the water runs off the land quickly and causes more erosion and flooding. During dry spells, little water is held in the soil to sustain the crops, so they die much more quickly. 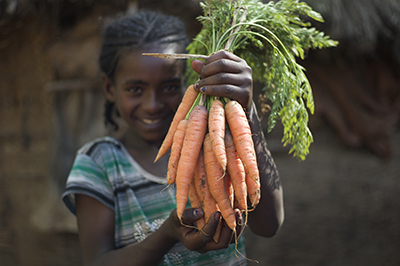 Just one weak or ruined harvest can devastate the farm families we serve. But it is possible to mend exhausted farmland using many of the same techniques used by organic farmers and gardeners in developed countries. Regenerative agriculture is a process of restoring the land, maintaining soil fertility and water availability, minimizing damaging cycles, and increasing farm families’ resilience. Smallholder family farms do not exist or thrive in a vacuum and CRS does not treat them as if they do. It is vitally important to step back from the farm and understand the surrounding landscape. CRS works at both the farm and the landscape levels. In both cases, the objectives are the same: (1) increase the soil organic matter and fertility, and (2) protect the soil (and the organic matter it contains) from erosion or other forms of degradation. The key difference between the farm and landscape levels is the types of solutions that are needed and which can be practically applied. Local communities and governments: These programs involve the local communities and governments in the design, development and maintenance of the watershed management system. This approach requires considerable community organization and education, particularly in natural resource management principles. Training and organizing: We show communities how to create water-management structures such as continuous contour trenches, water infiltration pits and small dams. We plant trees beginning on upper slopes of watersheds to reduce erosion as we continue planting down the slopes. Grasses and trees are also used to cover and protect soils within the watershed. Results: CRS-led watershed-management projects can reduce harm from flooding, increase crop production in the face of droughts, and increase watertable levels and stream flow throughout the watershed. Gullied land abandonned to erosion can be recovered as soils fill in, and seasonal streams can become perennial. CRS Watershed management programs take into account the relationships of all elements at play in the landscape. The programs have increased the productivity of rural communities and increased resilience during climate fluctuations. Farm level: Conservation agriculture guides our approach to regenerating soil productivity. Key principles: The three key principles of conservation agriculture are (1) minimize soil disturbance (e.g., through minimum or no tillage), (2) maximize soil cover (e.g., by leaving a mulch on the soil when there is no crop) and (3) use crop rotation to promote soil health. Conservation agriculture with trees: In some cases, CRS practices conservation agriculture with trees. Trees grown in the crop field work as “nutrient pumps.” Their roots go well below the roots of crops, enabling them to pull up nutrients that the crops would not otherwise reach. These nutrients move up into the leaves of the trees and are later dropped on the surface of the field when the trees shed their leaves. The right kinds of trees will not hinder crop growth, and can actually enhance it because dispersed shade in the field can help lower temperatures for crops that can’t tolerate high temperatures. Leveraging knowledge and expertise: Because restoring watersheds is only one part of the solution – CRS also works with leading scientific experts to identify and scale production systems involving more intensive use of green manure, cover crops and other agroforestry techniques. These techniques are applied on farms, and nitrogen fixing plants have similar effects on the soil fertilizer. They can help keep farmland covered, retaining soil moisture. Green manure/cover crops also provide a secondary source of highly nutritious food in areas where malnutrition rates are high. In November 2016, Catholic Relief Services led a team of technical staff, partners and farmers from Bolivia, El Salvador, Guatemala, Honduras and Nicaragua to visit Dr. Kofi Boa and the Howard G. Buffett Centre for No-Till Agriculture (CNTA) in Amanchia, Ghana. This video presents the inspiring experience and work of the CNTA, narrated by Dr. Kofi Boa, the center’s director.